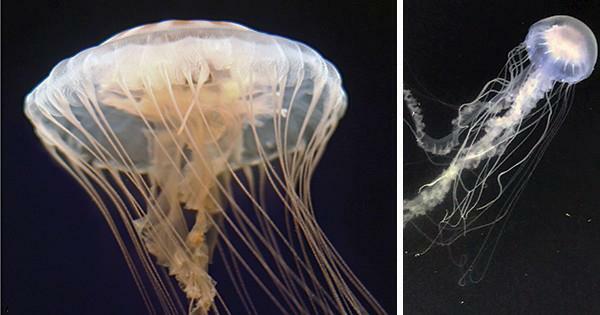 University of Delaware professor Patrick Gaffney and alumnus Keith Bayha, a research associate with the Smithsonian’s National Museum of Natural History, have determined that a common sea nettle jellyfish is actually two distinct species. The Atlantic sea nettle is one of the most common and well known jellyfish along the U.S. East Coast, especially in the Chesapeake Bay and Rehoboth Bay where they commonly sting swimmers in large numbers. Since it was described nearly 175 years ago, the jellyfish has been assumed to be a single species. The discovery that is was actually two distinct species, Gaffney said, was made possible by DNA sequencing techniques. Turns out, the ocean-based sea nettle jellyfish is larger and has approximately 40 percent more tentacles (40, as compared to 24) than its bayside counterpart. The ocean sea nettle also has a larger bell, the top portion of the aquatic animal, while the tentacles are shorter than those in the bay nettle species. Bayha, the paper’s lead author, earned his doctoral degree in biological sciences at UD in 2005. While at UD, he worked closely with Gaffney at the Hugh R. Sharp Campus in Lewes and, during fieldwork, collected jellyfish off the Delaware coast near Cape Henlopen. Bayha’s interest in the species continued well after he completed his degree, and he’s collected specimens everywhere from Norway to Brazil, and studied museum specimens from the Smithsonian, where he now works. The newly recognized of the species is the bay nettle, which is found in less salty waters called estuaries, such as the Chesapeake Bay. NOAA produces a daily jellyfish forecast for the Chesapeake Bay, where jellyfish blooms can sometimes become a nuisance. According to Gaffney, having two distinct species may explain why efforts to understand the factors that affect a jellyfish bloom are so difficult. The discovery also may be good news for the Eastern oyster, which is found on the Atlantic and Gulf Coasts and is the most widely consumed type of oyster. This is because bay nettle jellyfish eat harmless comb jellies called Mnemiopsis, a key predator to oyster larvae. If the bay nettles are effective at scooping up the Mnemiopsis, then the Eastern oyster larvae may have a better chance at survival. Interestingly, the new research showed that the bay nettle seems to be closely related to jellyfish found in coastal regions of Ireland, Argentina and Africa. But according to Bayha, it’s not unusual that no one took notice of these differences before. The researchers reported their study findings in the scientific journal PeerJ.